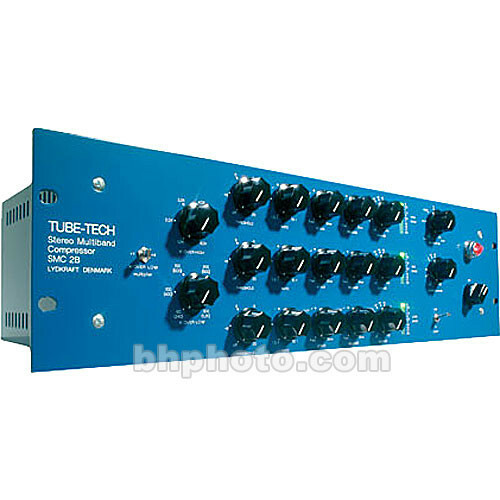 The Tube Tech SMC 2B is a tube based, stereo, multi-band compressor designed to add vintage quality warmth to a mix. The unit features three independent optical stereo compressors with the signal being divided into low, mid and high bands by 6dB/octave crossover networks with selectable frequencies for the low/mid band and for the mid/high band. The design of the crossover networks optimizes the summing of all three bands, resulting in a flat frequency response (within +/-0.25dB) when the gain controls for each band are set to the same level. Each of the three compressors features threshold, ratio, attack, release and gain, while an LED ladder displays gain reduction. Master levels are set with output gain and balance controls. Both input and output are balanced and have fully floating transformers with a static screen. The power supply and the side-chain circuits are based on a solid state circuit. With the exception of the output stage, all DC voltages are stabilized. Dimensions (WxDxH) 19" x 8 1/8" x 5 1/4"
Box Dimensions (LxWxH) 23.0 x 14.0 x 10.0"